Use this guide to help you determine the appropriate Library of Congress subject heading for a topic you are searching for. This guide can assist in locating books or other items you are having trouble locating using the catalog's regular search methods. 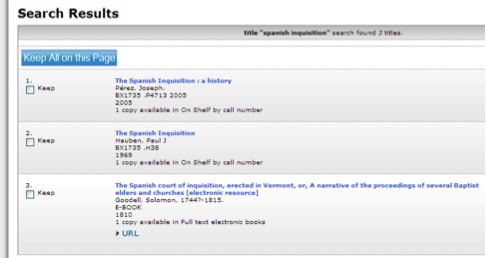 When browsing for items in the stacks, look for call numbers in your subject area. Call numbers will begin with a letter depending on their subject association. Click on the links below to view a more detailed breakdown of the call number ranges and more particular subject areas. Often the most efficient way to search in the online catalog is by the subject heading assigned by the Library of Congress. Sometimes these are easy to guess (for a person, it’s simply the person’s name); sometimes they aren’t (for example, for World War II it’s “World War 1939-1945”; for the California Gold Rush it’s “California—Gold discoveries”). 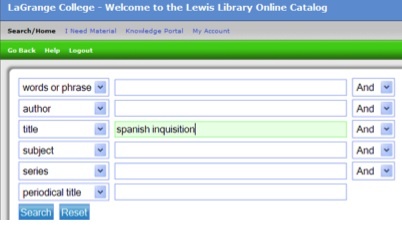 (5) Click on the “Subject” link (or do a “Subject” search for “Inquisition Spain” from the main catalog page). This gives you 25 titles—far more than a “Words or phrase” search for “Spanish Inquisition” would retrieve.